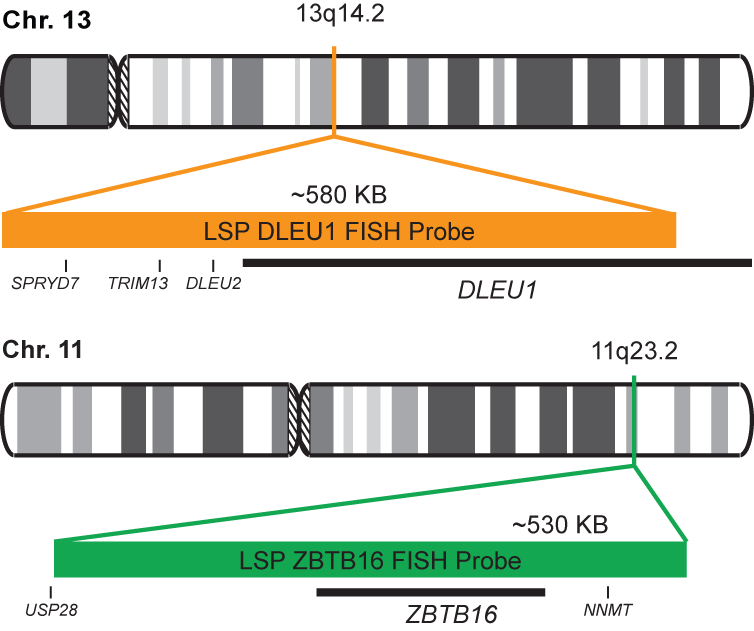 The DLEU1/ZBTB16 FISH Probe Kit is designed to detect the human DLEU1 gene, located on chromosome band 13q14.2, and theZBTB16 gene on chromosome band 11q23.2. Rearrangements and abnormal expression of the DLEU1 gene region – also known as BCMS, DLB1, LEU1, LEU2, XTP6, BCMS1, DLEU2, LINC00021 or NCRNA00021 – have been observed in B-cell chronic lymphocytic leukemia (CLL), multiple myeloma (MM) and other malignancies. Fusions and aberrant expression of the ZBTB16 gene – also known as PLZF or ZNF145 – have been reported in acute promyelocytic leukemia and other neoplasias.